The council approved a motion – 5 to 1 – to extend the $13 utility charge until Dec. 31. Knoblock voted ‘no.’ Councilman Gene Hoffman was not in attendance Tuesday. And here is where I give a hat tip to fiscal conservatives everywhere that oppose taxes (or in this case a user fee) on the grounds that once one is enacted it never seems to go away in favor of being forever re-purposed. For those in politics such “temporary” revenue streams must be like crack in its addictive capacity and that is certainly the case here with the $13 user fee, which was enacted because the previous Mayor had the City on the verge of defaulting on its Water and Sewer Bonds, a topic Slabbed Covered in detail back in 2014. Today it is being used to pay back half of the excessive engineering fees. It should not lost on anyone that Mayor Fillingame and Clerk Paula Fairconnetue were notified last December the excessive fees had to be repaid and that bit of bad news was hidden from the City Council. Sources close to City Hall tell Slabbed that Mayor Favre was given the letter by a City employee on the first day he took office in July, 2017. Lana Noonan’s perusal of the City Council minutes indicate the second appeal was discussed behind closed doors in 2014 in an executive session despite the fact this issue would not qualify for a closed door discussion as litigation is not involved. It almost seems like this whole deal has been purposely hidden from the public for at least four years but certainly longer and I say that because the FEMA denial does not give the date they made their first re-payment demand. The Applicant appealed and argued that all requested engineering design costs should be eligible for reimbursement because the PW scope of work described a stand-alone utilities project that required preliminary engineering design considerations. Indeed the first project worksheet (PW) in November 2005 was stand alone but as Lana’s picture above illustrates the City knew as early as April 2006 it would be doing a joint project on Beach Boulevard and per the FEMA letter the City knew by June 2006 the first PW would no longer be valid. NonetheLes, the City in September 2006 awards a contract to Compton Engineering based on the November 2005 PW instead of the new one they knew was coming based on the June 2006 correspondence with MDOT. Slabbed has been advised by a source with knowledge of City Hall operations circa 2006 that the person handling FEMA recovery for the Mayor Eddie Favre Administration was Les Fillingame. Fillinagme was assisted in that position by former City CAO Buz Olsen. 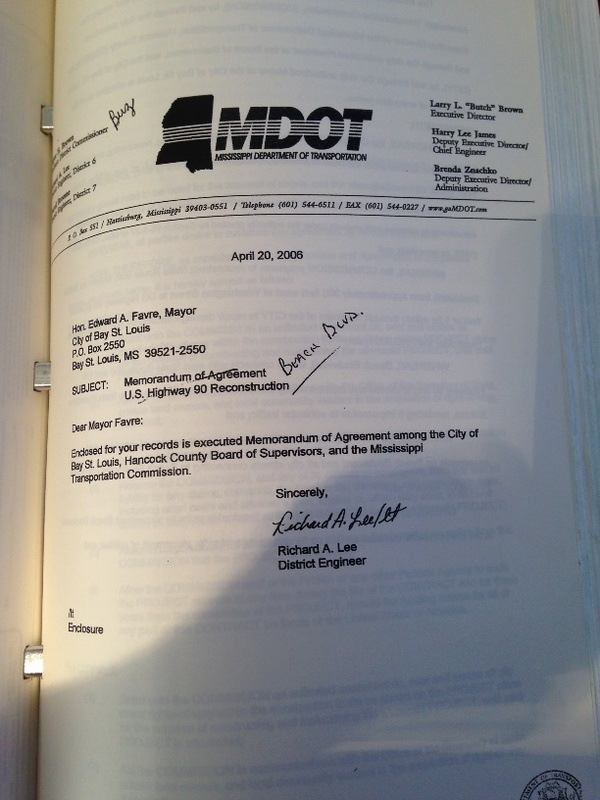 The word “Buz” is even hand written on the April 2006 letter from MDOT. At this point all we have is speculation. Was this Bay St Louis officials acting like FEMA was Santa Claus or something worse. I doubt we will find out the answer to that question but at the end of the day the ordinary folks in the Bay are the ones being stuck with the tab. I suspect we will learn even more in comments so fire away folks. A masterful touch with the keyboard! It’s not alost (almost) interfering with my spelling… it is! It is amazing that this Payback Demand final notice from FEMA hit the email of then Acting City Clerk, Paula Fairconnetue and her boss, Leslie Fillingame, 6 months exactly to the day, Dec. 15, 2016, that Sam Atkinson of the Office of the State Auditor, presented her Performance Audit Report to Mayor Fillingame and the Council, June 15, 2016. In her report, Atkinson emphasized the importance of the Mayor and his administration providing the Council with ALL CLAIMS against the city, and noting that internal control problems on the part of the administration resulted in a material weakness. If Fillingame had shared the Payback Demand Letter from FEMA when it arrived last Dec. of 2016, this could have been handled so much easier. It arrived at a good time of year financially, because the Reserve Fund had $548,00, and ad valorem taxes were coming in mid January. No, he hides it, and the new Mayor gets it at the leanest time of the year. But why not wait now until mid January of 2018, to pay it? It’s not due until March 31. That, to me would be better than sticking it on the utility users bills. Like Doug said, that has become an addiction in government. Easy way out. Relieves public officials from having to think. Let’s start with Nov. 2013, when Fillingame could no longer get away with not paying his city’s garbage pick up fees to the Solid Waste Authority, of which he was Chairman. The Sea Coast Echo broke that story. The Council was lied to and tricked into thinking they were paying “current” bills with the $500,000 First Bank Loan they imposed on the taxpayers. The bills were actually from the previous fiscal year and, according to state law, should have been rolled over as an expense in an amended budget. You can’t borrow money in the name of the taxpayers to pay last year’s bills. Let’s move on down to the transfer, without knowledge of Council, on September 30, 2011, of $300,00 in Department of Justice Grant funds. No loans this time, just swiped it out of the taxpayers General Fund—yet to replace it. Do we all understand why this city has trouble paying their bills? The audit by the Miss Dept. of Revenue for the last 3 years has resulted in a demand for $12,000 in unpaid sales tax. You guessed it— the good old taxpayers again. And now the revelation of a Payback Demand letter from FEMA being hidden from Council by Fillingame since December 15, 2016. THE BOY HAS A PROBLEM! But, he also had a captive audience, the taxpayers, that Council continued to whip up on every time he strayed from the rules. The total of his escapades has cost the taxpayers of the Bay right at $872,000 to date. THAT’S THE CURRENT PRICE OF SECRECY–$872,000. You have to wonder why no surety bonds have ever been pulled. Then you have to wonder why the taxpayers even purchase them? For what? Council never utilizes them. Memorandum from Eng. Compton to Mayor, City of Bay St. Louis, dated May 22, 2013. Nice that Fillingame and Compton were communicating with each other. If only the Mayor had communicated with Council as advised by Ms. Atkinson of the State Auditor’s Office on June 15, 2016!! HAPPY HALLOWEEN–THE SKELETONS ARE STARTING TO TUMBLE OUT OF THE CLOSETS IN CITY HALL!! Filingame needs to be held accountable. I hoped that Harding would pursue Les and Lil Daddy Said Les so as to get some money back from that abuse of the legal system. His judge and attorney attempted to prosecute a case that should never have been on the docket! Lil Les Daddy Said is miserable now that she has to actually work with a time clock but as close friends have said Les has time to pick up of the kids! They will haunt us for at least next 2 years! Holy crap! Finally…. Tks Ms. Lana!! As a friend of Mike, Lonnie and Joey thank you, thank you! These three elected men knew immediately from day one BSL was in deep Les’ do-do. For the next four years they scraped, fought, argued, screamed, audited and investigated for the truth. You’ve proved to all their naysayers they were spot on correct. BSL voters made huge mistake in loosing these two. Think what Mike, with them, could do with facts in FRONT of them. I’m sure there’s more facts missing? Great job Ms. L.
Uh, Eddie Favre signed the contract to begin with, lest we not forget. You’re absolutely right. The post mentioned this began with Mayor Eddie Favre’s Administration. I am told he leaned heavily on his team back on those days which is good IMHO. That said he also bears the responsibility for what happened under his watch, even for things which he may have been misinformed. Eddie didn’t hide signing the contract. On the other hand, Les hid FEMA’s final payback demand notice to the city. I will not vote for Farve again!!!! Ward where? I’m a Waveland resident/with much family in Bay. I hope he sues too so they can question him & David “Cough” on stand about garbage, insurance, DOJ, Fema/MEMA, illegality of pay raises etc. plus why he spent it without Council approval? Then if this Council has guts revoke his bond after he per juries himself. Bring it on Ms. Lana! The only thing Les spins on is his muddle finger! Not a spin. New Mayor was handed FEMA Payback Demand Final Notice several days after taking office. Previous Mayor received it last Dec.
Look at the date on the document. Minutes subsequent to Dec. 2016. Lest we give our readers the impression that we are only concerned with the price of $ecrecy in the goings on at the Bay St. Louis City Hall, let’s take a little trip down a few blocks into the Bay, specifically 200 N. Second St. where the Bay St. Louis-Waveland School District Central Business Office, where there is definitely just cause for concern. Since February of this current calendar year, I have tabulated some pretty healthy legal bills we’ve paid to a law firm in the Jackson area—Adams/Reese. To date that total is $64,842.69, which is in addition to our own contracted School Board Attorney who is paid $32,500 a year retainer. “inspect” these legal records. You know, to look at what are we getting for all of this legal advice over and above our own attorney. The PRR form at the School District has a fee schedule on it for copying or reviewing public records, which is from $.50 to a $1.00 a page if you want them to make copies for you. I did not request copies, just to review these legal invoices. If any research, reviewing or clerical work is involved, the price is $12 an hour. Less than a week after my Request, Superintendent Vicky Landry contacted me by phone to tell me my request to “inspect” these legal records would be $439 an hour!!! This is because, according to her, they originated with an attorney in Jackson, and he would have to remove certain information from them, and he charges $439 an hour, which would have to be borne by me. The Miss. Public Records Act, which addresses the redacting of information from Public Records to protect personnel, etc. states clearly that it is to be done by the Public Agency where they are kept, and there is no requirement in the law for the Agency to go out of District to have them redacted. Mayor Mike Favre has, to his credit, made a great appointment to the School Board in the person of Vicky Arnold, and he has another coming up in February of 2018. We will get to those bills and review them. In the meantime, just use your imagination as to what she’s hiding. Visited a County Agency this week and made a PRR for their 2016 Audit and Profit and Loss Sheets. Need I tell you, they called me back and said neither document is done. Maybe I’ll just pick them up a Calendar at Wal Mart to remind them 2018 is looking us in the eye. WHAT PRICE $ECRECY IN GOVERNMENT??!! of my knowledge, they’ve left the line item in. Hhmm. Smell…. All but Knoblock, Rachael. He was the lone ” no” vote on putting on your utility bill. Don’t doubt your calculation otherwise– but that was the vote for the record. My mistake. Thanks for pointing it out. Gary Knoblock was a no. He waches out for the citizens. Thanks, Gary. I agree. The incumbents had to have some idea that it was at least possible. They were in the Nov. 4, 2014 Executive Session. When they came out, they authorized Rafferty to make another appeal to FEMA and gave the contract no. It matches the one in the payback letter. But, and this is key– when the DENIAL letter and payback demand arrived last Dec.
No one presented that to the Council. They knew they had appealed a previous denial, but the Final Notice was concealed from them. And, of course, Knoblock, Hoffman, Smith, Zimmerman, and DeSalvo knew nothing. That’s a great point, and a huge problem. They don’t appear to have a ticker list, a to do list. Things get dropped and forgotten. Someone should have remembered this was coming. We have two clerks of council. Maybe one could do it. Ms. Raphael as cpa: if it’s in 2018 budget this Council knows about it and why, they approved putting it there? Pay out ad valorum money, line charge whatever Dept. DONE. This 13 will create surplus, then 70 not amended/eliminated? That’s a tax surplus. I listen to tape ma’am, you and Mr. Gary only one knew reasoning. Ward 6 Guy??? and Larry stated do it this way and “we pay off faster and leaves us with $100k surplus”. Foolish: raised 4 mils, still got $13 flusher and a surplus. Y’all getting representation with a whole lot of taxation. Not smart. Well they jacked our taxes up 4 mills, that’s huge. They increasing our utilities for no reason. They will more than likely keep charging the $13.00 for eternity. They are pathetic, we have just a couple smart one’s elected but are useless when absent. Do they get paid when they miss meetings? We need to keep records of who cheats us. The Bay was booming in development, it’s going to be too expensive for people to stay. The election can’t come soon enough for me. If people can afford to live here in Waveland, they can afford the Bay. Trust me. We haven’t set any records with development, and you don’t want to see our utility bills!!!!!!! Yes, they get paid when they aren’t at the meeting. Also, the budget has their paid insurance in it. As I recall at the debates and forums before the elections, all candidates for the part time job of council member agreed the job should not include paid insurance. That insurance nearly doubles their salaries. Not right. Why do we pay for bonds? Can you please post line item amounts for the Adam-Reese legal fees beginning February to current date? I reviewed the dockets and my total is not the same as yours. I must be missing something. Let me explain why you didn’t get the same expenditures on Adams-Reese Law Firm as I did. I neglected to explain that my calculations go back to November of 2016, when the first claim was paid to Adams-Reese. At the August 14, 2016, School Board meeting, the Board accepted the resignation of then Superintendent Rebecca Ladner. At the September minutes the Board engaged the services of Adams-Reese. The first claim from Adams-Reese is in the November 17, 2016 Claim Docket. These docket entries were prepared by the Office of the Business Administrator of the School District, and approved by the School Board as documented in their minutes. Thank you for the information. Those legal fees were a result of a wrongful termination in which the employee disputed. This created a financial burden for the district I’m sure. But, she resigned on officially on Oct. 21, 2016.
Who determined her termination was wrongful, and how do you know this? Why we’re anymore legal fees necessary after her resignation and the case was resolved? If you are talking about the former principal from Waveland, she did resign. The wrongful termination was against the employee that was working with a certain school board member to get rid of the principal. I’m very surprised you don’t already know about this since you are always on top of these important issues. You might want to do a little more research I’m sure either one of them would be glad to talk to you. Why don’t you just talk to me? 228-493-4358. You are a great person when it comes to research and getting facts. It would be beneficial for you to contact one of them directly. I think it is something you would be interested in. Superstar, I’d like to know how 1 board member and 1 employee, can get rid of said principle ? Also why would she resign if she was wrongfully terminated ? Having to wait a bit. You ok? one was colluding with an employee to axe the Principal? And how would one know who the employee was? I think you know which board member and employee were working together. You know who the principal was so you can ask her. As I said, there is a great deal of information (with documents) that would be worth you investigating. Thanks for assigning to me the gift of clairvoyance, but I have no idea what school board member and employee were working together to axe the principal. Now, documents, I will always be willing to peruse those, but chatter, no. What I am concerned about currently is the state of Waveland Elementary and North Bay. Waveland has dropped to a D rating according to the State Dept. of Education and North Bay to a C.
You see, when everyone becomes distracted with hiring the best and highest priced lawyer to cover for them at the expense of the taxpayers, the children get put on the back burner. Not chatter… documented facts. And if you don’t know what I’m talking about then your school board friend is not very loyal to you. He must have pulled the wool over your eyes. Yes, shame on this school board member for wreaking havoc at Waveland. They were destined to fall without consistency in leadership. Hopefully they will make improvements now that they have consistency in leader and the school board member isn’t after him. Please go get the facts! You might be very shocked with what you discover! Trying to get the facts and documents as per the District Public Records Request policy. Just not going to pay $439 an hour for them as opposed to the $12 an hour as stated on Public Records Request Form, and since the contracted School Board attorney, Mr. Artigues has said that he would redact the documents I want to inspect for $00.00, will just do it as part of his retainer. Do you have any idea why Mr. Artigues could not redact my requested documents? Perhaps you can expedite my request since you seem to want me to have this information so badly. Hmmmm!! Well, that may be for me to know and for you to find out!! As I said, you know who to go see to get facts with documentation. Superstar, again it takes more then two people to get rid of a principle. Actually, more then half the board wanted her gone. Please read all documents including the court case of the WRONGFULLY ACCUSED employee against her, there were over a handful of teachers that testified to her abusive treatment and numerous letters of employees that left because of the way she treated them. There are over 20 employees that left waveland elementary under her watch and Let’s not forget her lack of knowledge of running a school. If she was asked a question about anything important, she referred you to said employee. The other employee that was actually WRONGFULLY terminated did not only the principles job but others as well. She also ran the dyslexia department that Waveland, now does not have. Numerous kids were left with no explanation and worst of all no dyslexia teacher. no one ever thinks of the kids. The final draw was when said principle made a decision on a child that was not only an illegal decision but it would have reflected back on said employee. The employee refused to allow it and refused to put her name on it. Animosity that was already there due to the principles jealousy of the employees relationship with the teachers, her knowledge and education that exceeded way beyond hers but also the fact that the employee proved her incompetent one more time. The principle exploded on her while Vicki Landry happened to be on the phone with said employee. It came down to the fact of “ if one goes they both go “ and this was decided by Vicki Landry the librarian who was standing as interim superintendent at the time. Sad part is the employee was WRONGFULLY terminated for standing up for not only herself but the other abused teachers. If any documents are read to find out the TRUTH, read the testimonies against said principle by her employees and then you decide. One more thing, do not think for one second that Waveland is in better hands, this guy is just as clueless if not more then the last principle and guess who hired him. We will save that story for another day. dropped to a D rating with the State. But one of our Waveland reps on the Board, Mark Kidd, stated at the Board meeting when Landry was given a 4 year extension on her contract that he was very satisfied with how the District was doing!!!! What I know is to follow School Board procedures for obtaining documents. Anything else you say about me is speculation in your part. It will all come to the surface. Which is why the “powers that be” make the paying public struggle so hard for info. They are drunk on power🍺!! You have always used information from others “word of mouth” to get your story out. Reality is that you don’t want to know what documentation is out there because it is the truth. I do hope you report EVERYTHING you find in those documents even if it’s against your one and only special board member. Well, suffice it to say I have hit a nerve with you!! You are beginning to sound like one of the “keepers” of public documents😳😳😳!!! Sweet. Sounds like you two need to visit. We like documents at Slabbed by the way. SuperStar, I am a teacher at Waveland Elementary! That principal got herself into trouble. You send a text to a friend on a Monday morning telling them how hungover you are and you really don’t t want to be at work that day. Oh in your not in the mood putting up with bitching teachers BUT guess what? She didn’t text her friend ( superintendent) she sent the text to the PTO president! Yep, that’s right. Also up on the beach, at a day invent Bouy’s was having, my principal was throwing up in a trash can because to much to drink! One hell of a role model for her staff, students, community. Last but not least, our professional principal was having a little fun time with a policeman in the community! Pass there on a Saturday her car and a patrol car! She was the best entertainment I had as a principal in a long time. As far as that board member you are referring to, It was Mr. Casey Favre. He is the only one listening to us. We are treated not like professionals , more like students. We all complained about how the moral at school was and that so call principal was causing this! She did not want us to work together and become a family or a team. She kept us on a tight leash and against each other. I can go on and on if you like. We have a chain of command to follow. Principal, superintendent and then board. We would never make it past the principal and if we did, only if we did, the superintendent backed her BFF! Mr. Favre listen to us. Trust me, he had know clue who we was because we sent anonymous letters but the man listen! As I said more than once, you know who to contact. Ball is in your court. You can paper the walls with that statement. Just not true. The process will work things out. You are scared of what you will discover but yes ma’am the truth with facts will indeed come out. If you have muck please send it. I won’t promise publication but I do promise to keep all communications confidential. Or mail it to me, many people do that. Everything you post is one sided. Why would I send it to you? Tell us more about this $65,000 hearing officer Jim Keith and the puppet Vicki Landry’s refusal to give Lana a return on her PRR without charging over $400. You alluded several time to these “documents” in your comments, why are you so scared to give them to her? Sounds to me like you’re both power drunk and full of it. You have three meetings before you become irrelevant, enjoy the time you have left champ. That’s right. Everything Doug posts is one sided, researched for legal accuracy, on the side of the law and the taxpayer!! The fear about these legal documents rests with those ” currently” in possession of them, and that explains raising the price from $12 an hour to allow them to be inspected to $439. I think you know who got shivers up their spines and it’s not us😩😳!!! Our own contracted School Board attorney has said he would redact the legal records I am requesting to inspect for $00.00. Will do it under his retainer. I am “scared” of what I will discover??!! Let’s do s little survey on this thread, including you, Super. How many commenting on this subject of Attorney fees to Adams/Reese law firm have actually visited the School District Business Office and made a Public Records Request for the information? I have. Please be honest enough to respond all of you. And please give the date you made your request. Scared. Right. That sure describes me!! Superstar is a phony trying to lure someone into their fray or they are too chicken sh!t to do their own work! I looked at the docket to get my info on the legal fees which you inaccurately reported that the amount was from February of this year. What else do you report that is inaccurate to fit into your agenda? I do not need to review the records. I know exactly what is going on in the district. If those figures are inaccurate, it’s not me. I didn’t calculate them, document them, and approve them. That would be on the Business Administrator, Superintendent, who he sends a letter to each month to please approve his docket before he presents it to the Board, and on the Board who vote to approve it and file it with the School District Financial documents. Hope you are not trying to pretend you don’t know this procedure! Not in the least. Too many people have the true facts on the reason for the legal fees. It will all come out in the end. As much fun as it as been “going against the majority” on this site, I must sign off for the week and focus on my business trip. Hmmmm, first I would get your facts straight. Four of the school board members did not know what was going on and did not want the principal gone. Ask them now why don’t you? The teachers that were against her were the teachers that did not want to do their job. More teachers supported her and provided her with letters of support. Twenty employees over four year.. retirement, babies, relocation, loss of limb.. yes most definitely her fault! Check out the numbers at the other schools also! Illegal.. not in the least.. check it out by calling the MDE. Did Ms. Landry do the right thing for either one of them? Of course not, but what did you expect? 1) yes other board members knew, U may not have been involved in that knowledge but Mark, Mike and Casey ( half the board ) all knew what was happening. They wanted her gone because she was in Becky’s back pocket. Becky just happened to go first. Ex. The voting out of Barlow and trying to push out Seymour. Let’s not mention the constant text and phone calls and private meetings between faculty and board members at the time. Sorry you where not involved nor invited. 2) One teacher ( Zito) went around the school asking for letters in the principles favor . None of them wanted to be involved but a few only a few who she intimidated felt if they said no and she was allowed to come back it would back fire on them. Actually one teacher that wrote a letter for her, she made chair after one year of teaching, again showing favorites. 3) none of the teachers that retired nor lost limbs are included in those numbers. 2 that had babies used it as excuses to leave that’s a fact and both spoke with board members to let them know this information. How do I know ? Because the board member asked me for their numbers to speak to personally and they confirmed why they really where not returning. And yes this was confirmed at the time this was all taking place. It is illegal to hold an ELL child back in KINDERGARTEN. Did I forget anything ? If you need any other information I will be more then happy to share with you, I have all the documentation put away, it was a horrible time for many and one many would like to forget. So Unless U where there ( like so many of us where ) or personally have text or emails to back your info up, do not waist my time with assumptions. Your response with all the grammatical errors is just too funny. LOL.. Check your figures of teachers leaving for three years back on all schools, especially Bay High. You are wrong with your numbers, along with everything else you have said. Yes, do ask the ALL the board members, including the members that were there years ago. And it’s very interesting that you know all of that. Cite your source along with documentation., Slabbed LOVES documentation. We do prefer documentation. Do you have a suggestion of a better source for information. In her defense, I think maybe part of the problem with Ms. Sutherlin as Waveland Elementary Principal was that perhaps she was not ready to be an administrator. Had she ever even served as an Asst. Principal? Why did Superintendent Ladner promote her? She did spend a lot of years in the classroom, which is good, but maybe several years as an Asst. Principal would have better prepared her for the top job as a campus Adm. working under a Principal. I am not sure Rebecca Ladner did her any real favors there. And certainly didn’t do the children and staff any. Then Ladner resigns, and who is in charge?? Yet another one who has little to no experience either in the classroom or as a campus administrator. Its’s a zoo, and the zoo keepers were those board members who kept perpetuating this insanity. Supposedly they interviewed 30 applicants for the position of Superintendent in a nation wide search, and came up with Landry. COME ON, PEOPLE!!!!!!!!!! They remind me of the closing song in the Broadway musical, “1776′ about the writing of the Declaration of Independence. AND WHAT HAS BEEN ACHIEVED? A “D” RATING BY THE DEPARTMENT OF EDUCATION! IS ANYBODY THERE, DOES ANYBODY CARE???!!! Principle at waveland was my elementary teacher. My source seriously, u just said I should check my sources but then admitted It was interesting that I know so much. Did I not point out MY sources, again I apologize you where not invited to the pow wows with other board members. No one cares about past board members, if they did they may still be there. Sounds like a lot of unethical work going on with the board members, getting rid of employees because they were in Dr. Ladner’s back pocket. If that is the way the board works, then they are setting the district up to fail. Shame on them! You should make that public in the Echo, not on Slabbed where only a handful see it. Oh and you mentioned earlier that you had to go to class, no teacher would have all of those grammatical errors. If the former principal was your teacher it would have been in elementary school. You should have made progress from elementary school. You zeroed right in on the most telling comment made by SuperStar of the whole lot. I’m impressed. On the Jeopardy game show that is the answer. The question Alex is Who is SuperStar? There is a reason SS was all talk with no docs. I smelled a pooflinger from the start. Documents are in the hands of the right people. Slabbed is not it. Superstar is just another politico similar to Susan Ladner. Just wanting to get someone into their fray. Just checked the Bay St. Louis-Waveland School Board Meeting Agenda for this coming Monday, November 6. They are going to recognize Bay High and the Middle School for their A ratings. North Bay fell to a C and poor Waveland Elem. is now D rated. Wonder what Ms. Landry’s recommendations will be for improvements???!!! The Board needs to hold her accountable. They can’t just recognize the good, they have to come to terms with the failures as well.